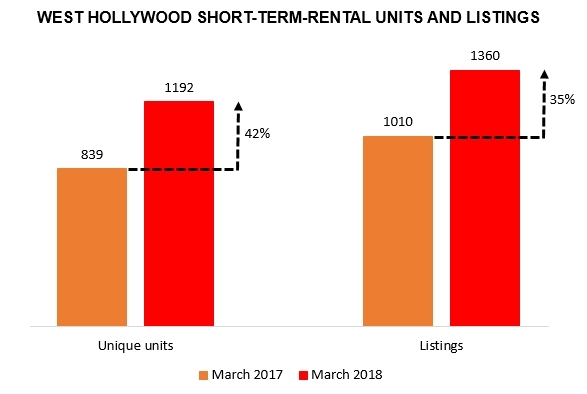 The number of West Hollywood short-term-rental properties has grown an estimated 42% in 12 months. The city had more listings (given its size) than all but one or two other cities in the region last year, though less than nearby Los Angeles neighborhoods. That is according to a new report by WeHo by the Numbers, using data from the city, state and a third-party website. The city’s short-term-rental market just entered a new phase, with partial legalization and new enforcement resources. The report establishes a baseline that can be used in the future to detect the impact of these changes. West Hollywood now has approximately 1,200 short-term-rental properties, compared to less than 850 last March. Some rentals are listed on more than one platform. The total number of listings is over 1,350, versus about 1,000 a year ago. That 35% all-platform growth rate was probably on par with – or a bit faster than – the prior year’s rate. Listings on the biggest platform, Airbnb, grew 29% from May 2016 to May 2017. At least seven out of 10 listings are for the entire home. Most of the rest are for a private room. The breakdown has not changed significantly from last year. The report compares the relative size of short-term-rental markets in different communities based on the number of Airbnb listings per 1,000 residential units. The estimates for cities are better than those for City of Los Angeles neighborhoods and unincorporated areas, due to differences in data availability. West Hollywood had 33 Airbnb listings for every 1,000 residential units in May 2017. That put West Hollywood in the middle among nearby communities. The adjacent Los Angeles neighborhoods were higher and the other Westside cities were lower. The neighborhoods with larger short-term-rental markets included Fairfax, Hollywood Hills West and Hollywood, which all had around 50 listings per 1,000 residential units. Beverly Grove’s market was also a bit larger than West Hollywood’s. The nearby cities had smaller short-term-rental markets. Beverly Hills had 24 listings per 1,000 units, Santa Monica had 18 and Culver City had 14. The report also compares growth rates. West Hollywood Airbnb listings grew almost 30% from May 2016 to May 2017. The growth rates in adjacent Los Angeles neighborhoods were all higher. They ranged from about 50% in Hollywood to almost 90% in the Fairfax district. In contrast, the growth rate was a third lower in Beverly Hills and Santa Monica at 20%. Culver City’s growth rate of about 15% was half of West Hollywood’s. Size and growth statistics for other communities in the region are included in the full report, What is the status of West Hollywood’s short-term-rental market? David Warren, the founder of WeHo by the Numbers, is a West Hollywood resident who explores community issues and the city government’s work through numbers. 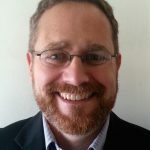 He welcomes suggestions and corrections at WeHoByTheNumbers.com.